PE0174. 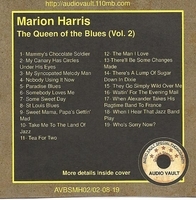 MARION HARRIS: The Queen of the Blues, Vol. II, incl. 19 celebrated Marion Harris titles. (Australia) Audio Vault AVBSMH02/02-08-19.